Since that ancient day when the first human drew a line connecting Point A to Point B, maps have been understood as one of the most essential tools of communication. Despite differences in language, appearance, or culture, maps are universal touchstones in human civilization. Over the centuries, maps have served many varied purposes; far from mere guides for reaching a destination, they are unique artistic forms, aides in planning commercial routes, literary devices for illuminating a story. Accuracy—or inaccuracy—of maps has been the make-or-break factor in countless military battles throughout history. They have graced the walls of homes, bringing prestige and elegance to their owners. They track the mountains, oceans, and stars of our existence. Maps help us make sense of our worlds both real and imaginary—they bring order to the seeming chaos of our surroundings. With The Curious Map Book, Ashley Baynton-Williams gathers an amazing, chronologically ordered variety of cartographic gems, mainly from the vast collection of the British Library. He has unearthed a wide array of the whimsical and fantastic, from maps of board games to political ones, maps of the Holy Land to maps of the human soul. In his illuminating introduction, Baynton-Williams also identifies and expounds upon key themes of map production, peculiar styles, and the commerce and collection of unique maps. This incredible volume offers a wealth of gorgeous illustrations for anyone who is cartographically curious. "Map-making is usually considered a serious, objective endeavour. But these whimsical creations aren’t just fun – they also give surprising insight into the British psyche....Despite the creativity of these maps, which range from games to political cartoons, they are as instructive as they are imaginative." "If you relish in the lost art of mapmaking, this hardcover book is perfect for whimsical browsing. With an extensive collection of peculiar maps—from those shaped like animals to the ones used for board games—it’s sure to spruce up your bookshelf and provide hours of fascinating material." "The book is the kind of quality production one expects from the University of Chicago Press, with excellent colour reproductions, thorough cartobibliography and serviceable index. Bayton-Williams is a third-generation map dealer and author of several other cartographic works; his experience shows. His descriptions often reflect research into both historical context and publishing history. By virtue of Bayton-Williams’s selections, the clarity of his descriptions, and the quality of the reproductions, this book is well suited to introduce the joys of old maps to a popular audience. And it also offers some useful material for experienced scholars, students and collectors. Beyond these virtues, I rank this work particularly high on the growing list of coffee-table map books because it shines a welcome light on cartographical curiosities. Mapmakers and scholars formerly embraced an ‘empiricist paradigm’: that the only legitimate objective of the cartographer was to create maps of ever greater geographical accuracy and clarity. There is today a new focus: ‘scientific’ and ‘curious’ maps alike stand on more equal footing, and all are subjected to more rigorous study and analysis. Baynton-Williams’s new book is another step in this direction, and that is one more reason to commend it." "In The Curious Map Book, antiquarian map researcher Baynton-Williams has assembled a glorious collection of historical maps, mostly from the collection of the British Museum. He selects fine representatives of several genres of maps dating from the sixteenth through nineteenth centuries, offering scholarly commentary on each." 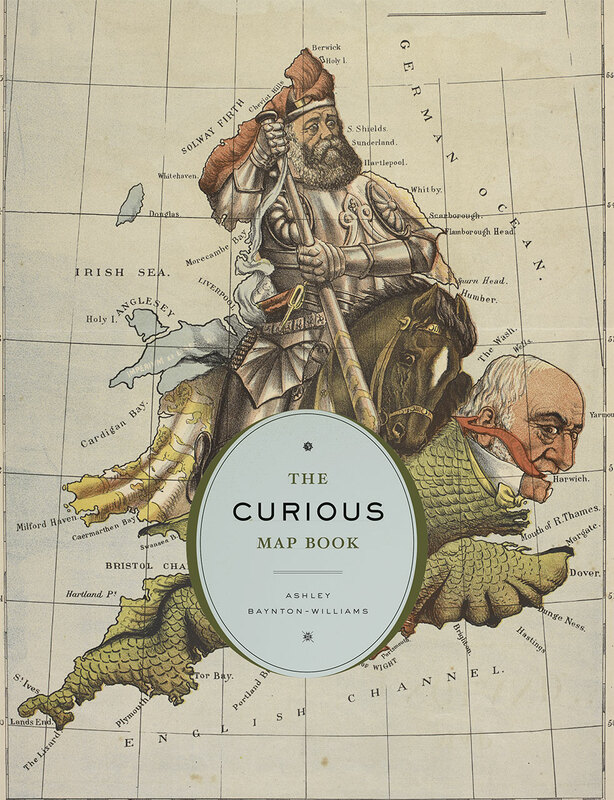 "The Curious Map Book is curious indeed, and delightful reading or browsing for geographers, historians, and map aficionados alike. A pleasure to read and, even more so, to linger over, savoring the cartographic details that may not help us to navigate anywhere, but certainly help us to understand how we got here."